Our range of products include uhmw rollers and load roller. 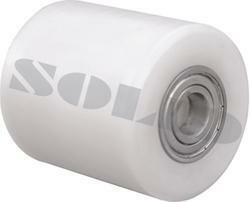 We have in store for our clients a unique range of UHMW Rollers. They are used in various industrial and commercial applications and are presented in different specification to provide total customer satisfaction. These rollers differ in its size, diameter and width and can easily be fixed to the other part of the machine or product. Additionally, they are available in different colors, with adjustable bore and diameter. wheels can be supplied having suitable grooves for Ball bearings and/or bearing-locks as well as with fitted Ball bearings and/or bearing-locks, Needle bearing/ Bush on request. Backed with a team of highly qualified professionals, we offer Load Roller (Series 904 - UHMW Rollers) to our clients. It is used for ball bearing fitting and differs greatly in its size. This roller in non detachable and is manufactured using premium grade raw material procured from trusted and reliable dealers. Its weight range is 760 kilogram to 1540 kilograms and is available in the normal rates.